With the air pollution increasing by leaps and bounds, you can’t neglect the need to breath fresh pure air. The impure air poses a high risk of respiratory disorders, so we suggest you invest in a good quality air purifier. The market has many variants but to find the best air purifier is a tricky task. In this article, you will find the list of best air purifier in India which will let you breath pure air at all times. In our research, we have consulted top 13 models, undergone 72 hours of research, and interviewed 4 experts. Our selection process was based on a few prime factors like efficiency to clean air, electricity consumption, machine life, warranty, price, maintenance charges and after-sales service. We have kept only those products in our list which have surpassed these factors in every way. If you would like to know our selection process you can navigate to our test process. You can also read our detailed Buying Guide to make a decision as per your need. Don't have any manual settings. Customers complain about the replacement filters availability. Air Multiplier technology and oscillation feature to powerfully project and circulate purified air throughout the room. Dyson is a British technology company manufacturing high-quality household appliances like air purifiers, vacuum cleaners, hair dryers, etc. The company has come to India in 2017. And within a year it has won the hearts of many people who believe in Top notch quality. It has an intelligent purification system that automatically cleans 99.95% of allergens and pollutants. It can clean as small as PM 0.1 microns particles like dust, mold spores, bacteria, pollen, pet dander, harmful gases, and VoCs. All these are real-time pollutants and are an indirect cause of many health issues. Along the power to eliminate these tiniest creepy creatures the Dyson air purifier also circulates the purified air throughout the room. Another amazing feature which we completely loved is the lower face velocity unlike other air purifiers. This feature along with high-quality VACUUM SEALED 360° Glass HEPA Filter makes sure that harmful ultra-fine pollutants are not released back into the room and stay captured in the filter media. Moreover, this best air purifier for home automatically monitors, reacts, and purifies the air. There is a Dyson app which you can install in your smartphone. It is also wi-fi enabled to help you monitor the air quality in your room and take a purifying manual decision accordingly. Lastly, you can control the air speed settings to level 10, set night-time mode, auto-mode, sleep timer, and an easy to clean aperture to maintain it. Overall, we suggest it as the best air purifier for homes in Delhi as Delhi is the one most pollutest city in India. Dyson Air purifier is one of the best air purifier in India for home as it has the power to swipe away even the ultra fine pollutants in air. Honeywell is another reputed company manufacturing quality electrical appliances since decades. With the pollution level increasing day by day they have come up with few advanced quality air purifiers and this one is the bets one from them. Honeywell Air touch i8 has intelligent purifying mechanism. It means that the purifier will sense the air pollution in your room and then guide the purifier to control function on basis of the pollution level detected. In our test, we found out that the purifier measures the real time pollution using it PM 2.5. Further, to purify the air completely it has three stages of advanced filtration system with combined patented HiSiv and HEPA filters. So, it can remove microscopic allergens, pollen, toxic gases, VOCs, odour, and formaldehyde. This way it can clean the pollutants form air with a whooping 99% efficiency. Further, we also found the efficiency works even during Diwali festival when there is smoke all around and the pollution level is exorbitant. We suggest it a good choice for kids room because of its efficiency, child lock feature, and no noise-operations. Works for upto 387 sq. ft.
Don’t have any manual settings. Honeywell i8 air purifier is the best air purifier in India for your home especially if you have small toddlers who are prone to cold and cough. Mi brand is a newly launched air purifier in India but in no time has been a necessity for many homes. It is loved by Indians due to its outstanding coverage area and smart cooling features. In spite of its high functioning, the cost of this best air purifier is low. Mi purifier looks like a tall rectangular box in a new compact design. It is equipped with high precision laser sensor to detect particulate matters as small as 0.3 micron instantly. Further, it purifies the entire room in 10 mins with its ultra-fast filters. The clean air delivery rate of it is 310m³/h. What impressed us more is the three-layer filtration. The outer layer is for airborne particles, the middle layer is for micron-sized particles and harmful bacteria, and the inner layer is for activated carbon, formaldehyde, and other room odors.In addition to all this, you also have the access to real pollution rate. Download the MI smart app on your phone to monitor pollution levels, adjust air flow rate, and switch on/off mode. So, the entire device works from your phone in a jiffy. On the whole, if you are looking to invest in a budget-friendly air purifier than this can be the one. Clean air delivery rate of it is 310m³/h. Customers complain about the replacement filters availability. Sometimes, it is out of stock so you need to keep a check on the availability. Mi air purifier is an affordable air purifier in India with decent functioning and quality features. Philips 1000 Series is one of the best portable room air purifiers in India when it comes to performance and efficiency. The CADR(Clean air delivery rate) is high to ensure clean and fresh air to a maximum area. The purifier is made from Vitashied IPS material in an aerodynamic design and Nanoprotect Pro filters for extra durability and ultra clean air. These filters can effectively clean ultra-fine particle as small as 0.02um. It also works to remove the harmful gases and bad odor. The device has one auto-sensor mode and one night mode. With the auto mode, the smart air sensor detects PM2.5 levels and boost the air purifier speed to balance out the pollution level. And with the night sensing mode, it prepares your bedroom for sleep delivering clear air while you are fast asleep. Be rest assured, it has dim lights and negligible sound when functioning to give a disturbed free environment at all times. It is quite appealing to see that the company make sure that every tiny things are also taken care off.Lastly, there is a color ring on its board to help you check the air quality. It works as 4-step color, ranging from blue (good allergen & particle level) to red (bad allergen & particle level). On the whole, a quality air purifier from one of the most trusted brands. Phillips 1000 series is a decent working air purifier in India. It is good for areas that have low-medium pollution levels. Ideal for indoor spaces up to 350 sq.ft. With Atlanat Air Purifier, you can enjoy pure air free from harmful toxins, smoke, dust, bad odour, and allergens. It is ideal for home, office, hotel, hospitals, and public places.Altlanta air purifier comes with a main unit and a remote controller. After dyson it is the second company which has given a remote controller along with the machine. With a single purification system, it is impossible to remove the pollutants from the air especially in metro cities of India. This is why we have considered this purifier as it has stages of air-purification. It uses pre-filter, HEPA filter, anti-bacterial filter, UV, photo-catalyst, and ionizer. Further, it is also equipped with icluster technology that focuses on eliminating pollutants by coordinating with multistage filtration. The purifier is also equipped with a particular time slot, night mode, and speed controller. The night mode reduces the noise produced by the motors and fans giving you an uninterrupeted sleep throughout the night.Overall, Atlanta is the good air purifier that matches the basic requirement of a purifier for a small room. Works for spaces upto 350sq.ft. Atlanta healthcare is a air purifier in India for small rooms only. If you have a small area to cover you can go for this at anytime. Buying Guide- What Considerations To Look For When Buying An Air Purifier In India? When buying an Air purifier you should consider a few prime factors before choosing one. It is important as it is an investment of health and money both and you don’t want to spend on something that is not worth it. Down below, you will find a list of considerations that you should jot down before choosing any best air purifier in India for your home. These are the most important recommended kind of filters. We suggest these as the best air purifier in India for Delhi homes as Delhi is very polluted. These filters can trap dust, pollen, mites, mold spores, fungi, pet dander, hair, and smoke effectively. 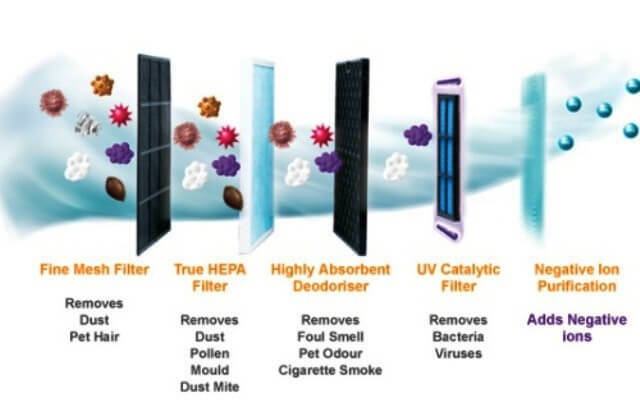 They work to remove 99.7% of airborne particle sizing from 0.3microns or more.When purchasing the best air purifier make sure you see the product should not claim to be HEPA like filters but should have a pure HEPA filter. The HEPA filters are classified from type A-E depending upon their effectiveness. The type A is the least effective and type E is the most effective HEPA filter. These filters work by emitting a cloud of ion in the air which fights with the air contaminants. These ions can fight well with even a particle size of 0.1 micron. Further, these filters are washable and last longer. You don’t need to replace often. The only glitch with these process is that it takes a little longer time to purify the air when compared to other filters. They are granular or powdered carbon pieces that are treated to be extremely porous. In this, a bed of activated carbon is used to eradicate contaminants and impurities using chemical absorption technique. They effectively work to remove a group of impurities like carbon, smoke, pesticides, sediments, volatile compounds, herbicides, and odour.Most of the new air purifiers in India have a carbon filter attached to the HEPA filters for advanced functioning and air purification. Many ACs and air purifiers come with photocatalytic filters. The catalytic in this filter is titanium oxide which is a semiconductor and is energized by ultraviolet rays. When a UV light shines on the surface of catalyst powerful electron are emitted out.These electrons work to clean the air. They combine with a water molecule in the air releasing hydroxyl ions. The hydroxyl ions are highly reactive and short-lived. They attack the organic and other pollutants in the air by breaking their bonds. When their bond is broken they release carbon dioxide and water and thus purifies the air. However, this technology is not recommended as it releases traces of ozone in the air. So, we don’t suggest you go for air purifiers using this technology.Our team suggest going for the air purifiers that use HEPA as the primary filter and ionic or/and carbon filters as the secondary filters. For the same, we have listed the products that uses the best kind or combination of filtration techniques. Room size is another crucial factor that you should look for. For large rooms you require large air purifiers and vice-versa. Make sure you check the coverage area of the selected air purifier with the area of the room in which you want to fit it. It is because if your room is larger than the average coverage area of the air purifier than the purifier won’t be successful in removing all the contaminants for your room. The amount of air an air purifier is capable of passing through its system in 1 minute is called the maximum air exchange rate. The higher this number is the higher is the efficiency of your machine. Additionally, purifiers with high air exchange rate work faster to clean the room of any contaminants.We suggest you to also look for clean air delivery rate(CADR). It will tell you how well the machine can purify the air inside the room. This way you can also figure out for what size of room your air purifier would work best. These two are also crucial factors. Most of the air purifiers are portable and weigh in few kgs. If you are planning to use your air purifier for multiple rooms make sure you buy a portable one as it will be easy to move from one room to another.Second, comes the noise level. Silent or low noise air purifiers are best as they don’t disturb when operating. The air purifiers coming with fan make noise. So, make sure if your purifier has a fan than there should be a option for fan settings too to control the noise levels. A few top quality air purifiers have automatic sensors to detect the pollution level in the air and then act accordingly. However, there price might be a bit higher. It is always recommended to go for the automatic purifiers if your budget permits. It is cost that you have to pay every 6-12 months for enhancing the life and functioning of your filter. This can be in the form of filter replacement or servicing.Most of the HEPA and carbon filters require regular filter replacement which can be expensive later. So, we suggest you to know about the replacement filter cost and then figure out your air purifier corresponding to your budget. Next, comes the running cost that is the cost of electricity consumption. Most of the good quality air purifiers run on 20-50 watts consuming less power even when run for the entire day. Look for the power consumption so as to cut down your electricity bills. It is always good to have few more features for convenience and faster operations. Look for features like filter alert, UV fault alert, manual settings, pollution level detector, and fan speeds. These features will help you monitor and operate your air purifier in a much better way although they are not crucial. The price is a personal preference. If your budget allows choose our editor pick Dyson Pure Cool Link Tower WiFi-Enabled Air Purifier. Nevertheless, you can go for the budget friendly Mi Air Purifier 2S also. Both of them are the best air purifiers in India that work well for the pollution levels in India. What Test Was Done To Choose The Best Air Purifiers In India? Our team has spent nearly 3-4 days, walked into the top electronic stores to reach to this list. We personally went to the specific brand showrooms and met their brand manager to get an inside ut idea about the air purifiers. Additionally, we also consulted 4 environmental experts and health practitioners who guided us what is best for the human health and mother earth. As our focus was on India so we were keen to check the pollution level in different regions of India. For the same, we picked up few metro cities for testing the air purifiers as they are the most polluted cities of India. After testing, we included only those products that work best for even the highly polluted regions. We evaluated all the models on the prime factors air purifying efficiency, maintenance cost and the overall performance. For the same, we have come up with a table analyzing the overall performance of each product in percentage. The list of the best air purifiers in India has been jotted down with lot of efforts and testing. All these purifiers are best in many terms and are tested considering the requirement of Indian homes.Today, air purifier is an absolute necessity for our health as they actually safeguard us from an array of diseases. Pick anyone form our list with a close eye. We assure you, you will thanks us later for your wonderful purchase.